When it comes to cold climates, the most vulnerable element of the dash cam is the battery. Batteries don't get along with extreme temperatures, neither extremely low nor extremely high. A solution to this problem is to use a capacitor (instead of a battery), which is immune to the cold or heat. Another aspect to consider is that during the winters, the days become shorter and shorter while the nights are correspondingly longer. Furthermore, visibility conditions are often poor during the winter even during the day. A dash cam with night vision support is the way to go to work-around these issues. I live in Toronto, Canada and I ended up buying a DDPai mini2 dashcam. It is equipped with a built-in supercapacitor and it features night vision as well. In addition, I bought a separate 128 GB MicroSD card with Class 10 rating that is not included with the camera and it is required to store the footage. I am happy so far with the camera and I definitely recommend it. If you have a dash cam and live in a cold place as well, do you mind telling us about it? What kind of camera did you get? Is it working properly? Any other tips that we should consider when buying a dash cam for a cold climate? I would definitely appreciate if you leave us a comment below and give this article thumbs-up by clicking the Google Plus (G+) button at the beginning of this post. Our party of 7 stayed at the Holiday Inn Hotel & Suites Windsor (Ambassador Bridge) for one night (Saturday, May 7th, 2016). We just needed a place to spend the night after visiting Point Pelee National Park early that day. Check out our adventure in Point Pelee by clicking the link above. We were 3 couples: 6 adults and one kid; so, we occupied 3 rooms. We all agreed that the place was fairly decent. It was clean, quiet and the service was great. The pool was clean and nobody else was there. It belonged to us for the next hour and a half. Clean towels are provided in the pool. There is a hot-tub in the pool area; which we enjoyed of course. From there we went to the rooms to have a shower. The rooms looked kinda old, but they were clean and well organized. The hair dryer in my room was out-of-order. The hair dryers in the rooms of my other trip comrades were ok (I asked them). I could have called reception to get it replaced, but my wife insisted to keep her hair a little moist. The air conditioning was working properly, but at some point during the night it started to make very annoying noises. I think the pipes got frozen somehow and because of that the device started to malfunction. I had to turn it off and use it in fan-mode for the rest of the night. We had dinner and some drinks at Grill 55. This restaurant/bar is next to the lobby of the hotel. The food here was great. Pretty much everyone in hour group ordered something different and everybody liked it. I must say we were very hungry, but still, the quality of the food and the service was excellent. Parking is conveniently located directly in front of the main entrance of the hotel. You can see a Tim Hortons directly from the parking lot; where we had breakfast in the morning. As I said, we just stayed one night: we checked in late in the afternoon and left early the next morning. We had no chance to check the other amenities of the motel. Overall our stay was positive and I would not mind to stay at this place once more. We picked this hotel because we wanted to do some sightseeing around Windsor and the location was fairly close to the Windsor waterfront. We liked Windsor, and we will share our experiences in another post. If this information was useful; share it with the Google Plus (G+) button at the beginning of this post. Thanks. Point Pelee is the southernmost point of mainland Canada. It is a peninsula filled with trees and lots of wild life. It is very famous for the diversity of migratory birds that show up in the park in spring (April 29th, 2016 -> May 18th, 2016). This is known as the Festival of Birds and it was our main motivation in visiting this place. Birds also make their stop at Point Pelee in autumn. They take a break there before continuing the migration south in search of a warmer climate. I haven’t visited Point Pelee in autumn, but I am tempted. The Carolinian Forest dressed up in the fall colors must be gorgeous. I will probably visit it this year again and if so, I’ll share my experiences in this blog. Point Pelee is a 4 hours’ drive from Toronto, but believe me, it is totally worthy. So, my wife and I (plus a bunch of other friends) left Toronto around 7am in the morning on Saturday May 7th, 2016. We took the 401 West stopping just once in one of the various OnRoute along the highway. We arrived at the park around 11:15am. One quick note here: once inside the park we could not find places to have lunch. They have some stores in which you can get snacks, but nothing heavy. You can only get potato chips, ice cream, pops and things like that. Nonetheless, just one block before the entrance of the park, there is a place where you can have burgers, wraps, hot dogs, fish and chips, soft drinks. It is not a fancy place, but it gets the job done. We paid the fee at the entrance, $19 bucks per family (up to 7 people in the same car). You can also pay individually. The pass to the park is valid for the whole day, so keep the receipt in case you want to have lunch outside of the park. With the receipt at hand, you will be able to get back into the park. You are able to hear the singing of the birds all around. Now, if you really want to see them up-close, you should get yourself a pair of binoculars. I was the only one in our group of 7 carrying binoculars. Because of that I was the only one able to see a pair of deer in the distance and I was able to see the birds hidden in the far away foliage. I recommend 8x40 long range pursuit binoculars. But hey, if you don’t have binoculars, that’s fine. All of us were able to see the birds, turtles (lots of them), and fishes (less than a meter away from where we were standing). We were also able to see wild turkeys (twice), which are not migratory birds. They were really sneaky, camouflaging very well in the bushes. They are kinda big and thanks to that we were able to spot them. There are several things you can do at Point Pelee: hiking, bicycling, bird watching, canoeing/kayaking, geocaching, swimming (at designated beaches), picnicking (picnic tables and grills onsite). For more details click here. There are two places that you mustn’t miss: the Marsh Boardwalk and Point Pelee's Tip. It provides a 1km long boardwalk over the marsh. It also has an observation tower and telescopes. From there you can get a sense of what Point Pelee really is. We left Point Pelee around 6pm with a lovely feeling in our hearts. We enjoyed nature at its best and we were satisfied. This is a place really worth seeing. We did not come back to Toronto that day. Instead we drove to Windsor and stayed at the Holiday Inn Hotel & Suites Windsor (Ambassador Bridge) (the previous link will take you to my review of the hotel). If you liked this post (trip) as much as we did; then share it with the Google Plus (G+) button at the beginning of the article. Thanks! The questions and answers below are specific to Yukon Territory. For more generic ones Canada-wise visit the flowing article: Canadian Citizenship Exam - Questions and Answers. What is the name of the Premier of Yukon Territory? Which political party is in power in Yukon Territory? What is the name of the Commissioner of Yukon Territory? What is the capital city of Yukon Territory? The questions and answers below are specific to the Territory of Nunavut. For more generic ones Canada-wise visit the flowing article: Canadian Citizenship Exam - Questions and Answers. What is the name of the Premier of Nunavut? Which political party is in power in Nunavut? What is the name of the Commissioner of Nunavut? What is the capital city of Nunavut? The questions and answers below are specific to the Northwest Territories. For more generic ones Canada-wise visit the flowing article: Canadian Citizenship Exam - Questions and Answers. What is the name of the Premier of the Northwest Territories? Which political party is in power in the Northwest Territories? What is the name of the Commissioner of the Northwest Territories? What is the capital city of the Northwest Territories? The questions and answers below are specific to the Province of Saskatchewan. For more generic ones Canada-wise visit the flowing article: Canadian Citizenship Exam - Questions and Answers. What is the name of the Premier of Saskatchewan? Which political party is in power in Saskatchewan? What is the name of the Lieutenant-Governor of Saskatchewan? What is the capital city of Saskatchewan? Which three natural resources are important to Saskatchewan's economy today? Farming, mining and natural gas. The questions and answers below are specific to the Province of Quebec. For more generic ones Canada-wise visit the flowing article: Canadian Citizenship Exam - Questions and Answers. What is the name of the Premier of Quebec? Which political party is in power in Quebec? What is the name of the Lieutenant-Governor of Quebec? What is the capital city of Quebec? Which three natural resources are important to Quebec's economy today? Pulp and paper, forestry and hydro-electric power. The questions and answers below are specific to the Province of Prince Edward Island. For more generic ones Canada-wise visit the flowing article: Canadian Citizenship Exam - Questions and Answers. What is the name of the Premier of Prince Edward Island? Which political party is in power in Prince Edward Island? What is the name of the Lieutenant-Governor of Prince Edward Island? What is the capital city of Prince Edward Island? Which three natural resources are important to Prince Edward Island's economy today? The questions and answers below are specific to the Province of Nova Scotia. For more generic ones Canada-wise visit the flowing article: Canadian Citizenship Exam - Questions and Answers. What is the name of the Premier of Nova Scotia? Which political party is in power in Nova Scotia? What is the name of the Lieutenant-Governor of Nova Scotia? What is the capital city of Nova Scotia? Which three natural resources are important to Nova Scotia's economy today? Coal mining, forestry and agriculture. The questions and answers below are specific to the Province of Newfoundland and Labrador. For more generic ones Canada-wise visit the flowing article: Canadian Citizenship Exam - Questions and Answers. What is the name of the Premier of Newfoundland and Labrador? Which political party is in power in Newfoundland and Labrador? What is the name of the Lieutenant-Governor of Newfoundland and Labrador? What is the capital city of Newfoundland and Labrador? Which three natural resources are important to Newfoundland and Labrador's economy today? Fisheries, oil and gas extraction. The questions and answers below are specific to the Province of New Brunswick. For more generic ones Canada-wise visit the flowing article: Canadian Citizenship Exam - Questions and Answers. What is the name of the Premier of New Brunswick? Which political party is in power in New Brunswick? What is the name of the Lieutenant-Governor of New Brunswick? What is the capital city of New Brunswick? Which three natural resources are important to New Brunswick's economy today? The questions and answers below are specific to the Province of Manitoba. For more generic ones Canada-wise visit the flowing article: Canadian Citizenship Exam - Questions and Answers. What is the name of the Premier of Manitoba? Which political party is in power in Manitoba? What is the name of the Lieutenant-Governor of Manitoba? What is the capital city of Manitoba? Which three natural resources are important to Manitoba's economy today? Agriculture, mining and hydro-electric power generation. The questions and answers below are specific to the Province of British Columbia. For more generic ones Canada-wise visit the flowing article: Canadian Citizenship Exam - Questions and Answers. What is the name of the Premier of British Columbia? Which political party is in power in British Columbia? What is the name of the Lieutenant-Governor of British Columbia? What is the capital city of British Columbia? Which three natural resources are important to British Columbia's economy today? The questions and answers below are specific to the Province of Alberta. For more generic ones Canada-wise visit the flowing article: Canadian Citizenship Exam - Questions and Answers. What is the name of the Premier of Alberta? Which political party is in power in Alberta? What is the name of the Lieutenant-Governor of Alberta? What is the capital city of Alberta? Which three natural resources are important to Alberta's economy today? My wife and I have invited our parents who live in Cuba to visit us in Toronto, Canada. One of the supporting documents of the Application for Temporary Resident Visa is the Letter of Invitation. The Letter of Invitation is written and signed by a person residing in Canada as a permanent resident or Canadian citizen, and it basically extends an invitation for the person abroad to visit him/her in Canada. There is no formal template for this letter of invitation, but I wanted to share the one my wife and I used before to invite our parents. It has worked for us; hopefully it will help others. Notice that this is just a template and you will need to adjust it to your particular case. Also, keep in mind that I am not a lawyer or an immigration specialist. This post should not be taken as advice on the matter. If you use the info here, you do it at your own risk. Finally, if this article was useful, I would kindly ask you to share it by clicking the Google Plus (G+) button at the beginning of this post. I, Cristopher Columbus, Canadian Citizen with Passport No. XXXXXXXX and residence at ____________________, Toronto, ON, Canada; wish to invite my father Mr. Dominic Columbus to visit me for a period of 3 months staying at my home. My father is a Cuban citizen with ID. No. YYYYYYYYYYY and Passport No. ZZZZZZZ; with permanent residence at ___________________, Havana City, Cuba. I hereby guarantee and assume all costs that may be incurred by my father’s visit such as plane tickets, travel insurance, accommodation, maintenance, and any other costs, so that he will be of no burden to the government of Canada. I’m employed (full time) as Naval Engineer at Voyage Inc. since April 15th, 2008. My wife, Filipa Moniz Perestrelo, is also employed full time as Sales Representative at Best Boats Inc. since February 31st, 2011. We have the financial means to take care of my father during his visit to Canada; the corresponding documents will be enclosed with the application. There are no intentions for my father to stay permanently in Canada. If you have any concerns regarding this matter, please do not hesitate to contact me at +1 (647) 000-0000 or by email at cristopher.columbus@email.com. What kind of electrical outlets and plugs are used in Cuba? 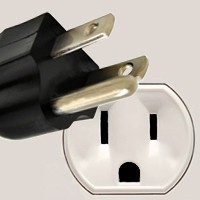 The voltage of the AC power plugs and outlets in Cuba is mainly 110V. To a lesser extent you can find 220V plugs and sockets as well. The frequency in both cases is 60Hz. All Cuban homes have 110V outlets and plugs. Additionally, some households have a secondary line carrying 220V, but this is really not the norm. As I said before, the norm in regular Cuban houses is 110 volts. You are more likely to find 220V sockets in hotel (resort) rooms. As a matter of fact, hotel rooms are usually equipped with both 110V and 220V outlets; so, make sure to plug your laptop, cellphone and other electrical appliances in the right socket. A quick interruption to let you know that I also wrote an article covering the kind of cell phones used in Cuba. Follow the link if interested. Advice 1: It is very handy to carry a 220V to 110V converter in case you need to down convert your outlet voltage. This way, you don’t even have to worry about picking the right socket: the converter will make sure to always deliver the proper output voltage at 110V. NEMA 1-15. 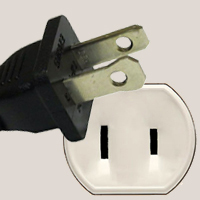 This plug has two flat parallel prongs. NEMA 5-15. This plug has two flat thick blades and an extra round earth pin. One thing you should know is that power surges and voltage drops are quite common in the regular Cuban homes. Power outages are also common. Power outages are dangerous; because in the first few seconds after the service is restored, the voltage spikes above its normal level, possibly damaging the electrical devices still hooked to the outlet. Voltage drops are also a problem, because devices will receive less power than they should and this will eventually affect them. I must say you can get by without the 3 Prong to 2 Prong Adapter. It would be better to get a surge protector that’s compatible with NEMA plugs and that also integrates a 220V to 110V converter. The Amazon product below is one good example of it. This one has two added bonuses: first, it has a couple of USB ports to charge your cellphone, table, camera, etc. ; second, it can be used not only in Cuba; but anywhere in North America, the UK, Europe and Australia. Finally, if you think the voltage converter is too much, a simpler choice would be to get a NEMA compatible surge protector with USB ports, like the ones below. They’re cheaper, because they don’t integrate the AC converter. If this info was useful, please share it by clicking the Google Plus (G+) button at the beginning of this post. Thanks. All the questions and answers listed in this post are covered in more detail in Discover Canada (Citizen Study Guide). This article mainly covers the topics at the federal level (Canada-wise). If this post is of your liking, don’t forget to click the Google Plus (G+) button next to the title of this article. Which federal political party is in power? Which party is the Official Opposition at the federal level? Who is the leader of the Federal Official Opposition Party? Name all the federal political parties in the House of Commons and their leaders. Conservative(Andrew Scheer), NDP (Jagmeet Signh), Liberal (Justin Trudeau), Bloc Quebecois (Mario Beaulieu), Green Party (Elizabeth May). What is the name of the Prime Minister of Canada and his/her party? What is the name of the Royal Anthem of Canada? God Save the Queen (or King). What is the name of the Governor General? Who are the Aboriginal peoples of Canada? The first people to live in Canada. What are the three main groups of Aboriginal peoples? First Nations, Métis and Inuit. A distinct people of mixed Aboriginal and European ancestry. Who were the United Empire Loyalists? Settlers who came to Canada from the United States during and after the American Revolution. Joining of provinces to make a new country. Which provinces first formed Confederation? Nova Scotia, New Brunswick and the Province of Canada. Which was the last province to join Canada? When is Canada Day and what does it celebrate? We celebrate the anniversary of Confederation July 1st of each year. When did the British North America Act come into effect? Why is the Constitution Act of 1982 important in Canadian history? It allows Canada to change the Constitution without asking approval of the British Government. What part of the Constitution legally protects the basic rights and freedoms of all Canadians? The Canadian Charter of Rights and Freedoms. When did the Canadian Charter of Rights and Freedoms become part of the Canadian Constitution? Freedom of religion and freedom of speech. Right to live and work anywhere in Canada, right to a fair trial, and right to protection against discrimination. What is the meaning of the Remembrance Day poppy? To remember the sacrifice of Canadians who have served or died in wars up to the present day. When is Remembrance Day celebrated? What does equality under the law mean? Being treated with equal dignity and respect, and having equal rights to speak out and express ideas. Vote, help others, care for our heritage and environment, obey Canada’s laws, respect the rights of others, eliminate injustice. What is an example of how you can show responsibility by participating in your community? Right to challenge unlawful detention, vote, apply for a Canadian passport, enter and leave Canada freely. What will you promise when you take the Oath of Citizenship? Pledge allegiance to the Queen, observe the laws of Canada and fulfill the duties of a Canadian. What are the two official languages of Canada? What is an example of where English and French have equal status in Canada? In the Parliament of Canada. Where do most French-speaking Canadians live? Which province has the most bilingual Canadians? Which province is the only officially bilingual province? What does the Canadian flag look like? White with a red border on each end and a red maple leaf in the centre. What song is Canada’s national anthem? Give the first two lines of Canada’s national anthem. O Canada! Our home and native land! True patriot love in all thy sons command. From where does the name “Canada” come? From “kanata”, The Huron-Iroquois word for village. Which animal is an official symbol of Canada? On what date did Nunavut become a territory? What are the three main types of industry in Canada? Natural resources, manufacturing and services. In what industry do most Canadian work? What country is Canada’s largest trading partner? Which region is known as the industrial and manufacturing heartland of Canada? Which region of Canada is known for both its fertile agricultural land and valuable energy resources? Who is Canada’s Head of State? Her Majesty Queen Elizabeth II. Who is the Queen’s representative in Canada? What do you call the Sovereign’s representative in the provinces? What is Canada’s system of government called? What are the three parts of Parliament? The Queen, the House of Commons and the Senate. What do you call a law before it is passed? Approval by a majority in the House of Commons and Senate and finally the Governor General. How are the Members of Parliament chosen? Who do Members of Parliament represent? Everyone who lives in his or her electoral district. What are the tree levels of government in Canada? Federal, Provincial and Territorial, Municipal (local). National defense and foreign policy. What is the government of all of Canada called? How many electoral districts are there in Canada? Who has the right to vote in federal elections? A Canadian citizen, 18 years or older and on voters list. What three requirements must you meet in order to vote in a federal election? Canadian citizen, 18 years or older and on the list of electors. When asked, who must you tell how you voted in a federal election? What do you mark on a federal ballot? How is the government formed after a federal election? The party with the most elected representatives becomes the party in power. The leader of this party becomes the Prime Minister. How is the Prime Minister chosen? The leader of the party with the most elected representatives becomes the Prime Minister. When must federal elections be held? On the third Monday in October every four years following the most recent general election. Which party becomes the Official Opposition? The party with the second most MPs. What is the role of the opposition parties? To oppose or try to improve government proposals. What is a voter information card? A form that tells you when and where to vote. Who has the right to run as a candidate in federal elections? Any Canadian citizen who is at least 18 years old. Who do Canadians vote for in a federal election? A candidate they want to represent them in Parliament. What was the Women’s Suffrage Movement? The effort by women to achieve the right to vote. In the 1960s, Quebec experienced an era of rapid change. What is this called? Which of the following is not a feature of Canada’s system of government: Dictatorship, a Federal state, parliamentary democracy and Constitution Monarchy? Who have major responsibilities on First Nations reserves? What is Canada’s national winter sport? How many Canadians have been awarded the Victoria Cross (V.C. ), the highest honour available to Canadians? What is meant by the equality of women and men? Men and women are equal under the law. Who are the founding peoples of Canada? What does the word “Inuit” mean? “The people” in the Inuktitut language. What percentage of Aboriginal people are First Nations? What did the Canadian Pacific Railway symbolize? What does it mean to say Canada is a constitutional monarchy? Canada’s Head of State is a hereditary Sovereign (Queen or King) who reigns in accordance with the Constitution. What is the highest military honour a Canadian can receive? In Canada, are you obliged to tell others how you voted? No, but you may choose to discuss how you voted with others. Who was Sir Louis-Hippolyte La Fontaine? A champion of democracy and French language rights and the first leader of a responsible government in the Canadas. What does the term “responsible government” mean? The ministers of the Crown must have the support of a majority of the elected representatives in order to govern. In Canada, are you allowed to question the police about their service or conduct? Yes, if you feel the need to. What is the role of the courts in Canada? When you vote on Election Day, what do you do? Go to the voting station with your voter’s card and ID, mark an X in the circle next to the candidate of your choice, fold the ballot and present it to the pools officials. What is the difference between the role of the Sovereign and that of the Prime Minister? The Sovereign is the guardian of Constitutional freedoms; the Prime Minister selects the Cabinet ministers and is responsible of operations and policy of government. What is the significance of the discovery of insulin by Sir Frederick Banting and Charles Best? Insulin has saved 16 million lives worldwide. What are some examples of taking responsibility for yourself and your family? Getting a job, taking care of one’s family, and working diligently in keeping with one’s abilities. Which three countries are signatories to NAFTA? Canada, Mexico and the United States. What was the significance of June 6th, 1944, invasion of Normandy? Canadians made a significant contribution to the defeat of Nazism and Fascism in Europe during the Second World War. Gloria is a new immigrant in Canada. What law allows her to take up jobs at par with a man? Equality of woman and men. Why is the battle of Vimy Ridge important? Canadian Corps secured its reputation for valor and bravery. What is a majority government? When the party in power holds at least half of the seats in the House of Commons. Which province is the main producer of pulp and paper and hydro-electricity? In the part of Toronto where she was elected. What is the Queen’s representative in the Territories called? How is a Cabinet Minister chosen? Canada has three territories and how many provinces? Why is trade with other counties important to Canada? It enhances our economy and raises our standard of living. How are the Senators chosen? They are chosen by the Prime Minister and appointed by the Governor General. What should you do if you do not receive a voter information card telling you when and where to vote? Call Elections Canada or visit their website. After a federal election, which party forms the new government? The party with the most elected representatives becomes the party in power. Which of the following statements about residential schools is NOT true? [NOT TRUE] The schools were welcomed by the Aboriginal people. [TRUE] The federal government placed many Aboriginal children in residential schools to educate and assimilate them into mainstream Canadian culture. [TRUE] The schools were poorly funded and inflicted hardship on the student. [TRUE] Aboriginal language and cultural practices were mostly prohibited. The descendants of French colonists who began settling in what are now the Maritime Provinces in 1604. What is the largest religious affiliation in Canada? Which Act granted, for the first time in Canada, legislative assemblies elected by the people? The Constitutional Act of 1791. Describe with one sentence the War of 1812. The USA invaded Canada and was defeated, which ensured that Canada would remain independent of the United States. Who was the first leader of a responsible government in the Canadas in 1849? Who was Sir Sam Steele? A great frontier hero, Mounted Policeman and soldier of the Queen. Who had played an important part in building the Canadian Pacific Railway (CPR)? What is the “Head Tax”? Race-based entry fee charged for Chinese entering Canada. Who is General Sir Arthur Currie? Canada’s greatest soldier in the First World War. Approximately how many Canadians served in the First World War? What three oceans border Canada? What is the capital city of Canada? Atlantic, Central, Prairie, West Coast and North. What are the provinces of Central Canada and their capital cities? Ontario (Toronto) and Quebec (Quebec City). What are the provinces of the Atlantic region and their capital cities? Newfoundland and Labrador (St. John’s), Nova Scotia (Halifax), New Brunswick (Fredericton) and Prince Eduard Island (Charlottetown). What are the Prairie Provinces and their capital cities? Alberta (Edmonton), Saskatchewan (Regina) and Manitoba (Winnipeg). What are the territories of Northern Canada and their capital cities? Which region covers more than one-third of Canada? In which region do more than half the people in Canada live? One third of all Canadians live in which province? Where are the Great Lakes? Between Ontario and the United States. Where are the Parliament Buildings located? Which country borders Canada on the South? Which province in Canada is the smallest in land size? What is a major river in Quebec? Cuba has two currencies at the moment: the Cuban Peso (in Spanish “Peso Cubano”) and the Cuban Convertible Peso (in Spanish “Peso Convertible Cubano”). Their respective symbols under the ISO 4217 standard are CUP and CUC. 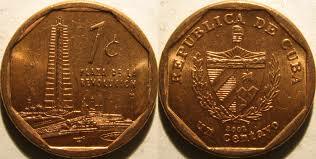 The Cuban Peso (CUP) was born in 1915. Specimens of different compositions, designs and face values have been minted over the years. 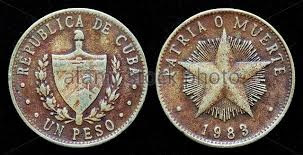 Many of them are no longer in circulation, for instance, all the silver and gold coins minted before the triumph of the Cuban Revolution in 1959 are no longer circulating. On the other hand, the Cuban Convertible Peso (CUC) is a fairly new currency. It appeared for the first time in 1994. Currently, this currency is at par with American Dollar (USD). What’s the difference between the “Cuban Peso” and the “Cuban Convertible Peso”? 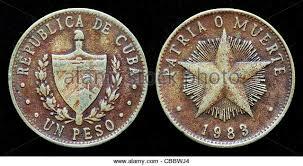 To summarize it: the “Cuban Peso” is the historical and national currency of the Cubans. It is what most Cubans are paid with. The “Cuban Convertible Peso” is a secondary currency that was intended to be the currency of the tourists visiting Cuba. The “Cuban Convertible Peso” is just a placeholder for the American Dollar inside the Cuban economy. Other important difference is that 1CUC is roughly 25CUP. This means the “Cuban Convertible Peso” is the stronger currency and it has 25 times the value of the “Cuban Peso”. Things have changed since 1994 and today you can see Cuban citizens using both the CUC and the CUP interchangeably. There have been talks (and gossip) about the unification of the two currencies into a single currency. If this happens, most people expect the “Cuban Peso” to outlive the “Cuban Convertible Peso". 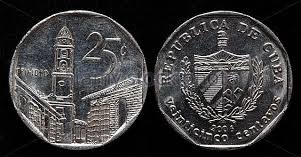 Currently, the coins in circulation have the face values of 1 cent, 2cents, 5 cents, 20 cents, 1 Peso and 3 Pesos (1 Peso = 100 cents). 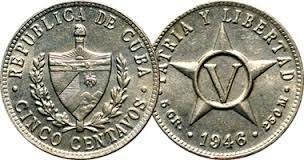 All the coins of 1, 2 and 5 cents that were minted after 1915 are legal tenders in Cuba. 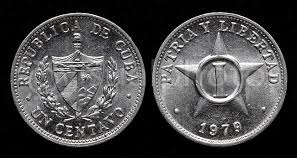 This is quite interesting; because all other Cuban coins minted before the Cuban Revolution (that came to power in 1959) were taken out of circulation. The exception was the coins of 1, 2 and 5 cents. 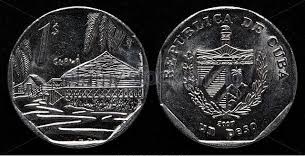 The coin of 20 cents currently in circulation was minted for the first time in 1962. There are two varieties of it. 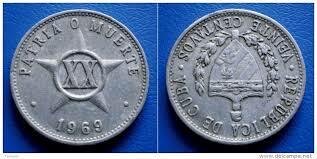 The 1 Peso coin began to circulate in 1983. 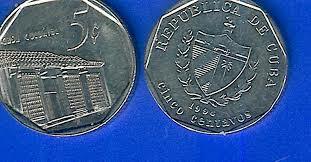 It was revamped years later in 1992 and a new coin of 1 Peso was born. So, there are two variates of the 1 Cuban Peso as well. 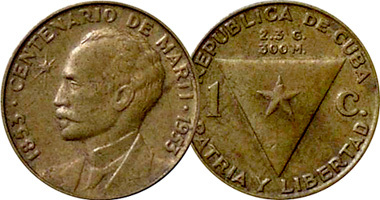 Finally, the 3 Pesos coin entered circulation for the first time in 1990. 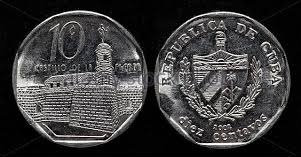 The first coins of the Cuban Convertible Peso were minted in 1994. 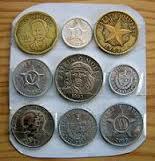 They corresponded to the denominations of 5 cents, 10 cents, 25cents, 50 cents and 1 Convertible Peso. These coins entered circulation in early 1995. 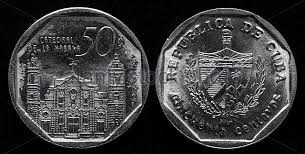 An interesting numismatic detail: the coins of the Cuban Convertible Peso minted in the year 1994 are slightly different from those minted in later years. The coins of 1994 and those that came later have the same design; but the Cuban Coat of Arms in the reverse of the 1994 coins is upside down if you compare it to the coins that came later. 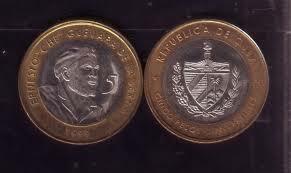 The 1994 coins were minted in Canada and after that, the Cuban Convertible Peso coins were (are) minted in Cuba. In the year 2000, the 1 cent coin was emitted for the first time. 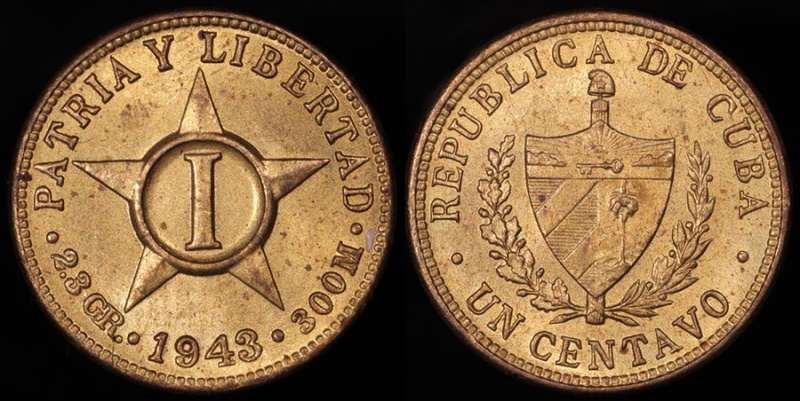 A bimetallic coin with a facial value of 5 Convertible Pesos entered circulation in 2004. 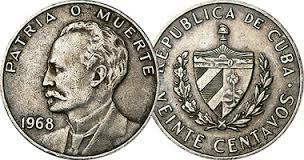 It was minted by the House of the Coin of Cuba (in Spanish “Casa de la Moneda de Cuba”) in 1999. This coin is very hard to come by. If you liked the article, show your appreciation by clicking the Google Plus (G+) button at the beginning of this post.